Changes are coming though I’m not talking about leaf colour, but about a change to my phone number and to my blog’s name in order to keep up with the personal and professional changes happening … all of which are pretty exciting results after years of doing the work! Have you heard of Tom Copland? He runs “Bible Finance” television ads in between televangelist, including Joel Osteen and Joyce Meyers? His accounting firm is based in Toronto and this Saturday from 9 to 1 in Stouffville at the Eastridge Evangelical Missionary Church he is offering the free workshop on how to not only live debt free, but also how to manifest the prosperity to do so. I’ve been studying financial gurus on how to do things differently when my cash flow increase…s again, yet even such financial wizards still consider debt as a necessity, especially for businesses and mortgages, but my study of the Bible revealed that debt is not what God wants for us because then we become servants to our debtors. So, if you want to do things differently because you too want different financial results, register by contacting Tom Copland’s Toronto office and get your name on Saturday’s workshop list. The workshop is free, though donations are also appreciated. For me, my contribution will be his accounting firm becoming my company’s accounting firm. Delighted to be back to creating my mixed media visual art during my chill time. And especially thrilled to discover my next piece will be part of the upcoming exhibition at Georgina Arts showcasing local and cottage talent. The exhibition opens Saturday, October 22, the Opening Reception is Sunday, October 23 at 1 pm, and the exhibition closes Sunday November 27. Of course, most works are for sale and the gallery commission is 39%. On a personal and professional note, when feasible, I also like to incorporate discarded materials to repurpose, so I was doubly delighted this morning when the exhibition’s required frame size for the artwork to be submitted showed up for me beside someone’s recycling bin and now awaits its conversion. Loving the experience of God meeting my needs in ways I had not even considered. And wow, His timing … always perfect! The value added to one’s life or an organization’s existence by “Connecting the Dots … with the Respect Principle” not only raises quality of life economically, but also environmentally and socially, including but not limited to family, spousal, friend, work, and community relationships. Individuals with higher “Respect Levels” continue to be students because of the wisdom they have gained by continuing to learn in order to live an optimal life. They have more integrity, make better choices, will do the right thing more often, take better care of themselves, manage their money better, help others, get involved in their community, in their country, and even globally. And by its very nature, higher “Respect Levels” developed by “Connecting the Dots … with The Respect Principle” naturally combats and even inhibits the high costs of crime and related impact on societies. “Connecting the Dots … with The Respect Principle” … because you, we, all want more. Though delayed for family reasons, my company launched 9/11/2014 because the social business venture is dedicated to eradicating the ignorance, prejudice, and hate that fostered the 9/11 and all terrorist attacks. 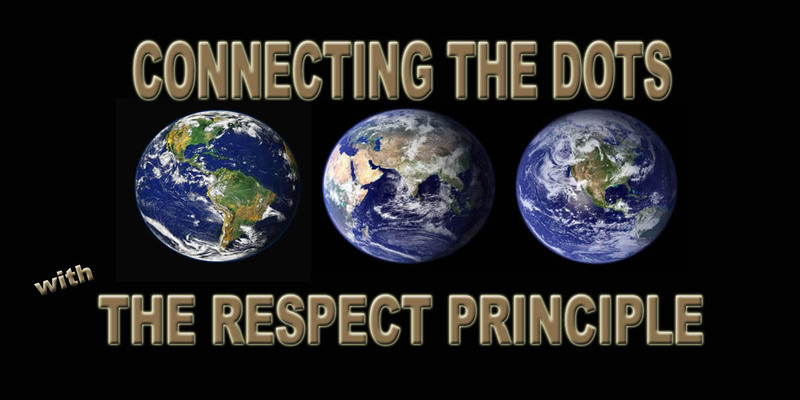 Connecting the Dots … with The Respect Principle … because we all want more.